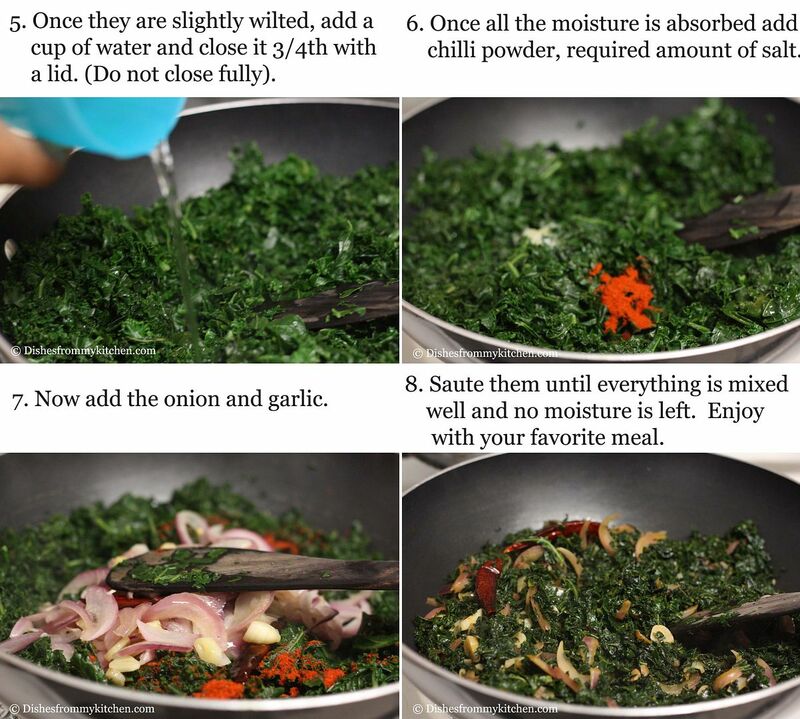 Dishesfrommykitchen: STIR FRIED KALE !!!! HEALTHY MEAL !!! Kale is one of the healthiest vegetables and it can be prepared in many ways. Since it has wonderful health benefits make sure to include them in your diet in healthier way like steaming the kale, adding them to soup, Salad etc. There are several varieties of kale; these include curly kale, ornamental kale and dinosaur kale(Tuscan kale) which differ in taste, texture, and appearance. 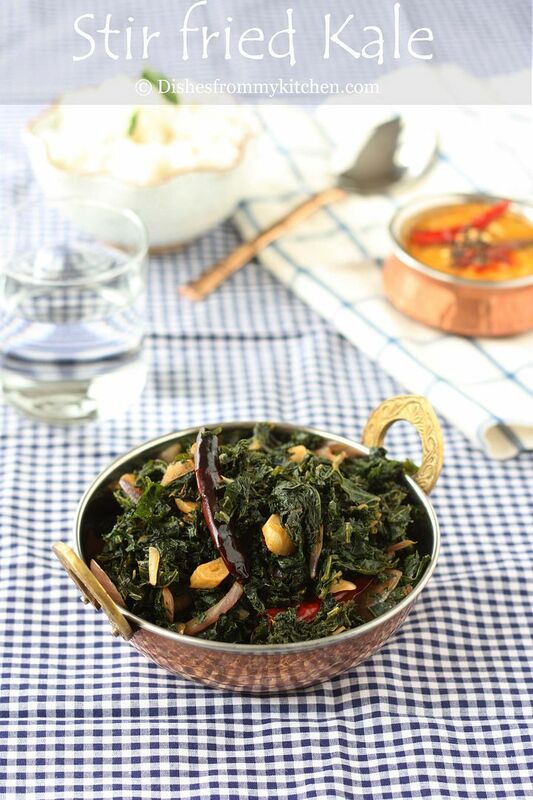 The recipe which I am posting today is stir fried kale in which I have used curly kale. It is deep green in color which has a ruffle leaves with a lively pungent flavor and delicious bitter peppery qualities. 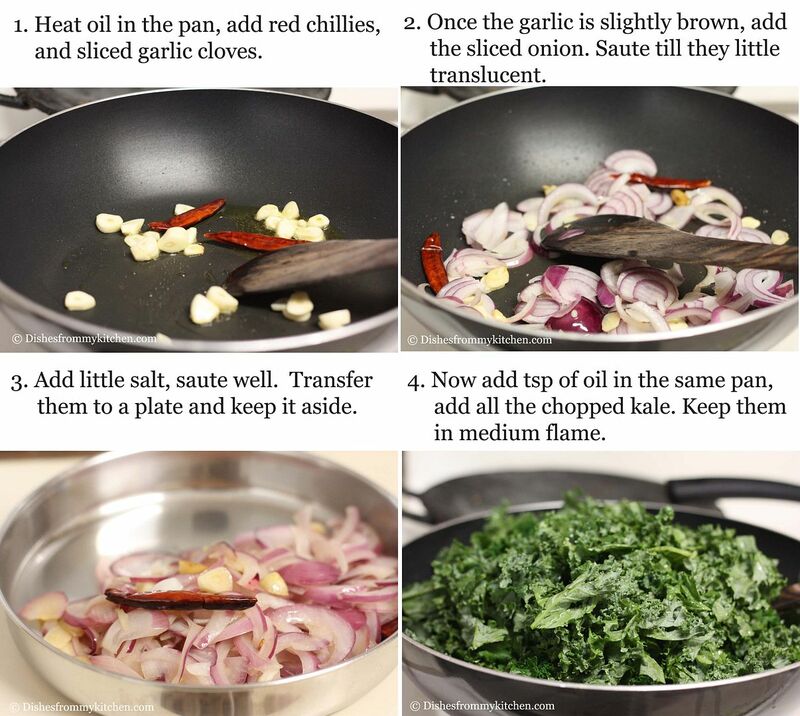 Again for this recipe you can use any variety of kale. 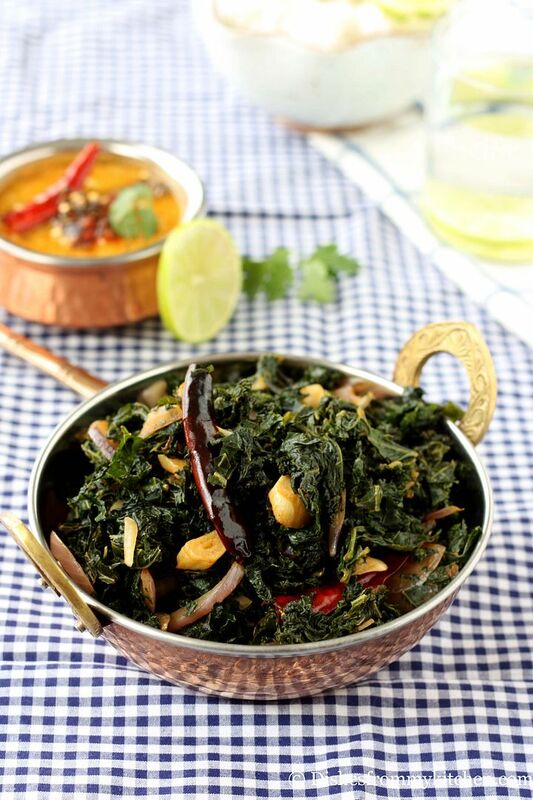 But personally for stir fries I love to use thick leaves which will retain it shape even when cooked with other Indian spices. I do miss lot of Indian green leafy vegetables but this kale is a rescue. 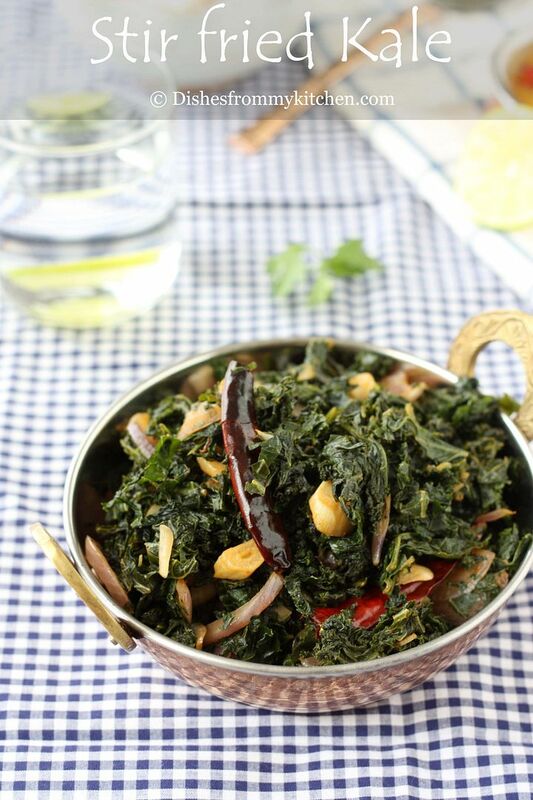 I use kale as a substitute for the recipes I make using Indian greens. You can also follow the same recipe for Swiss chard, Beet greens as well. 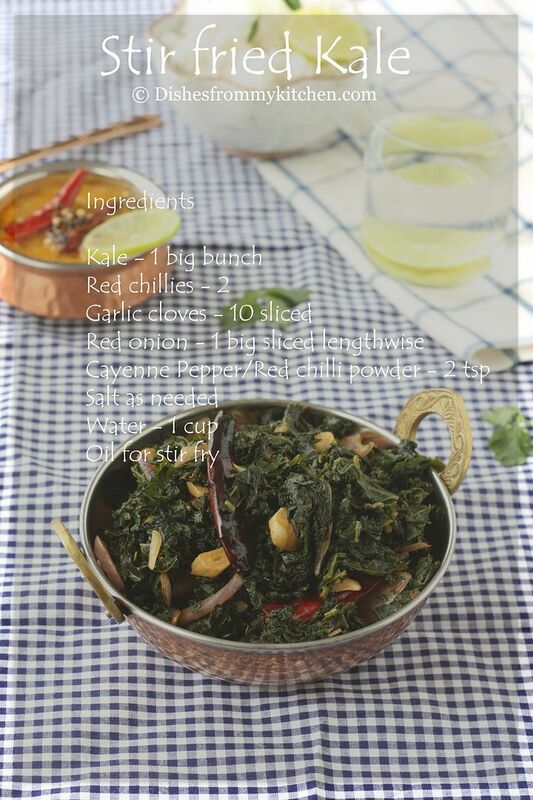 For healthy munching here try this KALE CHIPS which I have posted earlier. Water - 1 cup (You need 1 cup of water if the leaf is thick, if you choose tender variety of kale you need not use this much amount of water instead sprinkle with little water while sautéing. 1. You can also substitute red chilli powder with pepper powder. Use according to your spice level. 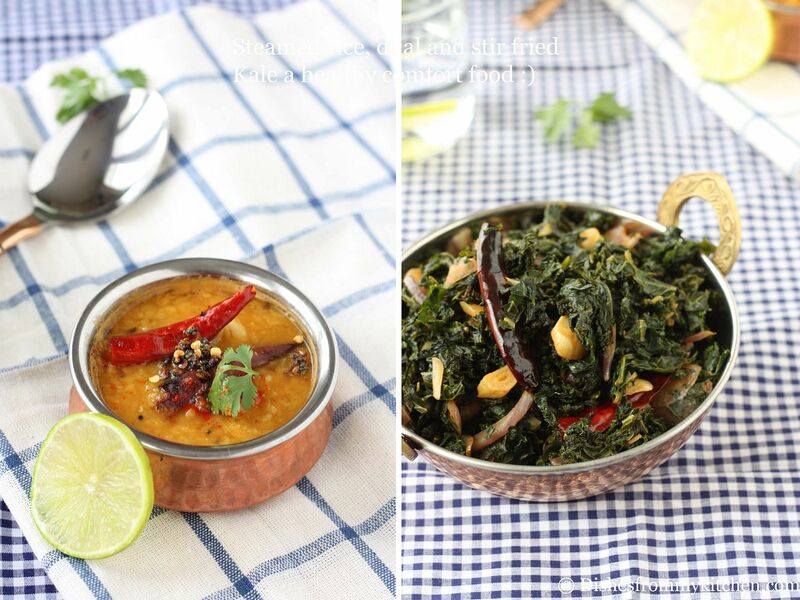 Enjoy Dhal, Steamed basmati rice with Stir fried kale along with little ghee (brown butter) !!! Wonderful stir fry! Missing it after moving to SG. Love to try this...Simply delectable!! Yummy stir fry...Love your clicks...Beautiful.. This looks so good and love all the beautiful clicks. Too good. I can have this healthy stir fry simply with a bowl of rice. Nice post and as usual amazing clicks. I never tried it but sounds delicious! Beautiful pics!